How do you sort your stash? By color? By size? Thread: How do you sort your stash? By color? By size? Would love to hear everyone's way of organizing. I sort my mini bolts by colour mostly. My Christmas fabrics are grouped together. I sort the fat quarters and half yards by color since they're all the same length and in drawers. The last time I had the mini fabric bolts on the shelves actually sorted out I shelved them by length since I can see what color they are. That sort of went away though after it was in a box, out of a box, and back in a box. Now I just stick it on the shelf. I have my Christmas fabric together, then my Halloween and Thanksgiving fabric, my children's fabrics, then my sports teams and then I sort by color. If I have very large pieces of fabric such as muslin and flannel (which I use a lot for the back of quilts) then those are kept separate from the other fabric. Most I sort by color - but (and there is always a but) I also keep my civil war fabric together,also the Christmas fabric is kept together and the batiks together. Backing is kept in another area. I separate solids, prints, batiks, wool, flannel and wide backings. After that, I sort them by size. For now. It may change. Mine are "ruler folded" and stored by color, except that batiks are on a shelf of their own, as well as some "oddball" fabrics that are not for quilting. Yardage is by color, scraps in separate boxes by color, with these entirely separate: flannels, Christmas, Valentine's, Halloween, Easter, 4th of July (and any other holidays I forgot), 1930's reproductions, 1800's reproductions, backings, fleece. Christmas and cat fabric separate, FQ's kinda by color unless it was a collection when I bought it. Anything over a yard is wrapped on boards expect for muslin which I keep on the bolt. Printed cottons, batiks, and solids are all stored separately and all are sorted by color. Size does not matter, at least for storage. Yardage is primarily sorted by color. I have a separate section for solids, batiks, plaids/stripes/dots, seasonals and novelty prints. Fat quarters (really anything smaller than 1/2 yard but too big for the scrap bin) are sorted the same way but are in shoe box style bins. And now I am happy to say I have my scraps cut and sorted too! They are only sorted by strip width though, for now. I really don't have my ruler folded fabrics in a reasonable order. I keep telling myself I need to get the like colors together. I have two big closets with wire shelves, one has backings and battings and some light fabrics. 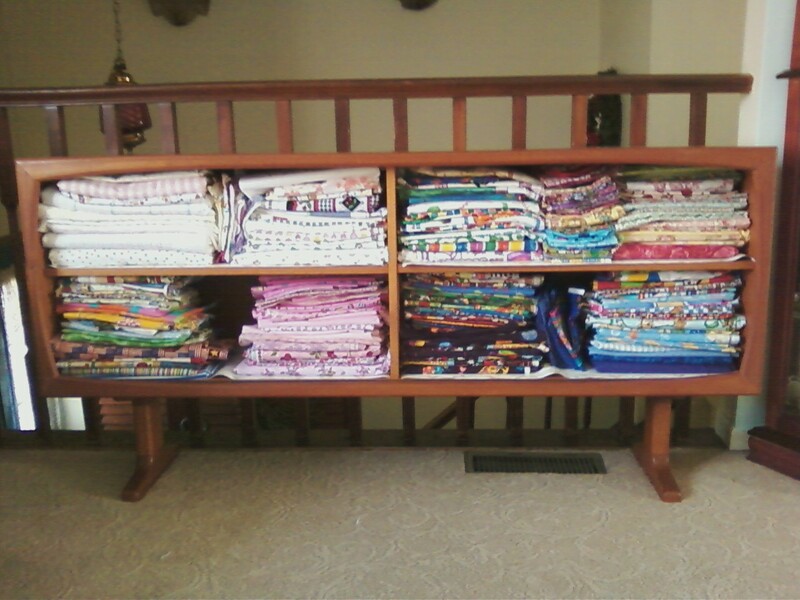 The other has the bulk of my fabrics, mainly just in stacks. Some smaller stacks on top shelf, that I can still see. I'm going to be working with some scraps. As usual they are really piling up. I now have another Dresden plate quilt ready to quilt. I have a cabinet with 4 shelves. Top shelf is smaller pieces and leftover 2 1/2" strips. Second shelf is larger cuts stacked vertically. Third shelf seems to be 5 yrds or larger on bolts stacked horizontally. Bottom shelf is flannel on bolts, some pieces of flannel and batting ready for rag quilts. You know after really looking at my cabinet to describe it, and re-organizing some of it yesterday, I really don't need to go on the shop hop next month. Even with the removal of fabric for the royal stars quilt I'm working on...I still don't have any space for any new material! Oh, what an unfortunate realization. equal coloring than they get grouped together. Ha! I thought I was the only one who had a separate "cat fabric" section! My fabrics are sorted by length - exact opposite of everyone else who sort by color. Less that a half yard are folded or cut down. Between 1/2 and 2 yards are ruler folded and placed in the drawer. More than 2 yards are folded onto full size bolts (the ones from the store). The coordinating fabrics are ruler folded, stacked together and then tied with a ribbon. The fabric groups that are for a specific pattern are placed in zipper bags with their pattern. 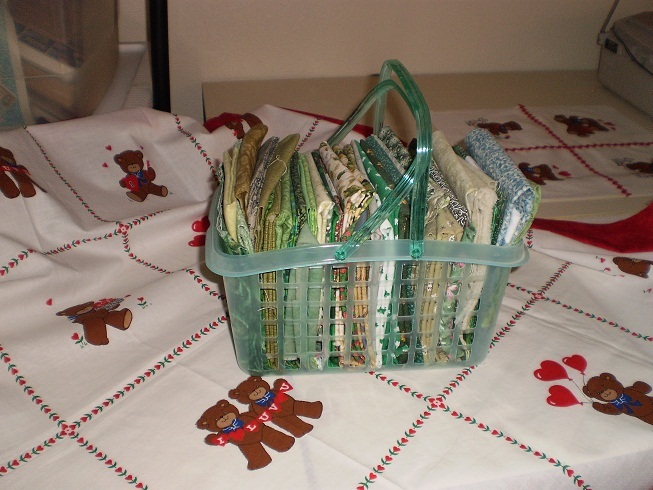 I have a couple of projects that I am gathering fabrics for - these are kept in baskets with their pattern. I prefer to sort by yardage because I can look at the fabrics that I have that meet the size requirements that I am looking for. I hate when I find a fabric that seems perfect for a quilt, but I don't have enough of it. Since I now sort by size, I know what I have of each fabric. BTW, each piece is tagged with their yardage notes and any other notes (single border, defect, whatever). Makes life so much easier. I have mine on comice boards, sorted by color. I keep novelty prints and holidays seperate. Mine are sorted by color and holidays and backings and backgrounds. I keep fat quarters by color in small plastic containers that are the right size for folded and standing upright. Mostly by color plus a few themes - christmas, cats, music, and backings and large yardages are separate. Since I have hundreds of FQs, I sort by colour into plastic 28 Qt containers with lids from Sterilite which are 23-inches long by 16-inches wide by 6-inches deep. Perfect fit for folding FQs into squares and standing them on end. With the "large" fold on top, it is easy to see the patterns and compare the nuances of that colour when pulling fabrics for a new project. The containers stack nicely: each stack has a large, deep wheeled container on the bottom of the stack. Large cuts go into the bottom container. Batiks are separate from regular cottons. I also keep Civil War reproduction, Christmas, Halloween, Laurel Birch, Kaffe Fassett, and African fabrics in their own bins. Cats have their own large container. Current projects have their own container with fabrics, threads, and pattern (if there is one). I love to sort and re-sort my fabrics. Sometimes I feel like Scrooge McDuck counting his piles of money. Anyway - at my most recent re-sorting I sorted by color, by intended use (i.e., I Spy fabrics, bindings or backings), seasonal, theme (i.e. Asian) and fabrics I'm collecting for a specific project. Any time I start a new project I get to sort all over again.